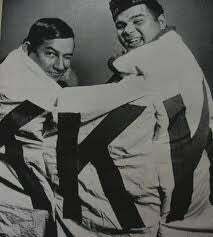 Sim and Charlie Warriax, two members of the Lumbee Nation, display a captured KKK banner. I heard about this on the Dollop and wanted to share it. It made my day. In 1958, the KKK in North Carolina started targeting the Lumbee, who had just gained federal recognition as the “Lumbee Indians of North Carolina.” They began with cross burnings and threatened further violence. They planned a rally, expecting 500 Klansmen to attend. Only 50-100 Klansmen came. Instead, over 500 Lumbee men arrived. Many of these men were veterans and were armed with sticks, rocks, and guns. They surrounded the KKK and attacked, wounding four and scattering the rest (who left their regalia behind.) The photo I posted shows two of the leaders celebrating with a captured KKK banner. Grand Dragon James W. “Catfish” Cole, who organized the rally, was given two years in prison for inciting a riot and the KKK ceased all operations in Robenson county. January 18th is celebrated as a holiday by the Lumbee to this day.